Affordable Accoutrements: Royal Doulton & Tiaras! I first posted this table in November, 2009. It was Thanksgiving, and I'd decided to host a (virtual) appreciation dinner ... along with a "coronation." In honor of this being the 150th week of Tablescape Thursdays, hosted by the inimitable Susan of Between Naps on the Porch! ), I thought I'd share it again. If the tablescaping community has a queen (Susan of course! ), perhaps we should also have a patron saint. My recommendation would be Hyacinth Bucket of the classic British situation comedy, "Keeping Up Appearances." Mrs. Bucket insisted her surname should be pronounced bou-quet. "It's French," she would say "but not TOO French." She had her faults, certainly, including being a social climber and a bit of a snob (particularly with regard to certain of her less upwardly-mobile relatives). However, the lady knew the importance of setting a proper table. Not just a proper table, but a spectacular one! A place is also set for Marty of A Stroll Thru Life, one of the very nicest people around. Marty invited me to participate in a cloche party. HERE's the post I did for it. Prior to that I thought a cloche was a hat! Thank you for the education, Marty, and for being so thoughtful and affirming in your comments to everyone in the tablescaping community. Don't forget to stop by Between Naps on the Porch for Tablescape Thursdays, Metamorphosis Mondays, and so much more! aaah. You are the master if Susan is the mistress. Your table is fantabulous! I am well aware that it's not a true word, but you know it's okay to make up words if one doesn't suffice! I think I have a coffee urn similar to yours - estate sale of course. And I love to languish over the silver watching the shine reappear and also say a prayer that someone will cherish it as much as I after I am gone.. Spectacular table! oh warm water on the flowers will also produce a speedier reveal! Bill, how appropriate to share this stunning table again. It it definitely regal ~ I dare say, fit for a queen! Fun guest list too! PS, forgot to mention Hyacinth!!!!! We watched her faithfully for years! So funny!!!! Thanks for bringing back memories of that show! Another beautiful tablesetting Bill, replays are okay with me! Just think how many times we set our table using the same dishes and just changing a few items to create a new look. Love your blog. Stunning as always and I can see the episode of Hyacinth where she reels back as her guests will when they see the table!!!! Love the china but Royal Doulton is special -- even if it doesn't have handpainted periwinkles! Just as beautiful the second time around. Dear Bill, what a STUNNING table! I didn't even know what a blog was in 2009....so I hadn't seen it first time around. HI Dear Bill! Oh, I remember this tablescape and was just amazed by it then and I am still amazed at seeing it again! Just so beautiful. Hope you're doing well and thank you for your kind comments. your table is really wonderful and fit for a queen. But you have the whole kingdom with the queen and all pricesses of the tablescape world on your table. What a wonderful event. As always your chine and the whole setting is fabulous. But the placecard holders are real eye catchers. OMG! I LOVE "Keeping Up Appearances"! I especially love your tablescape. Hyacinth would be green with envy. ;-) And all hail to Queen Susan. And where are your crown and cape and scepter? Thanks for sharing! It was such an honor to dine at this beautiful table, Bill! It is a pleasure to see it again, too. And such wonderful table mates, too! Bill, as always your tablescape is stunning. Love the addition of the tiaras and your china is gorgeous! Bill, you never disappoint! Love it! Still in Royalty mode after all the recent Royal Wedding carrying on, and this is so fitting to all of us in the Tablescape Kingdom! Your table is simply gorgeous. 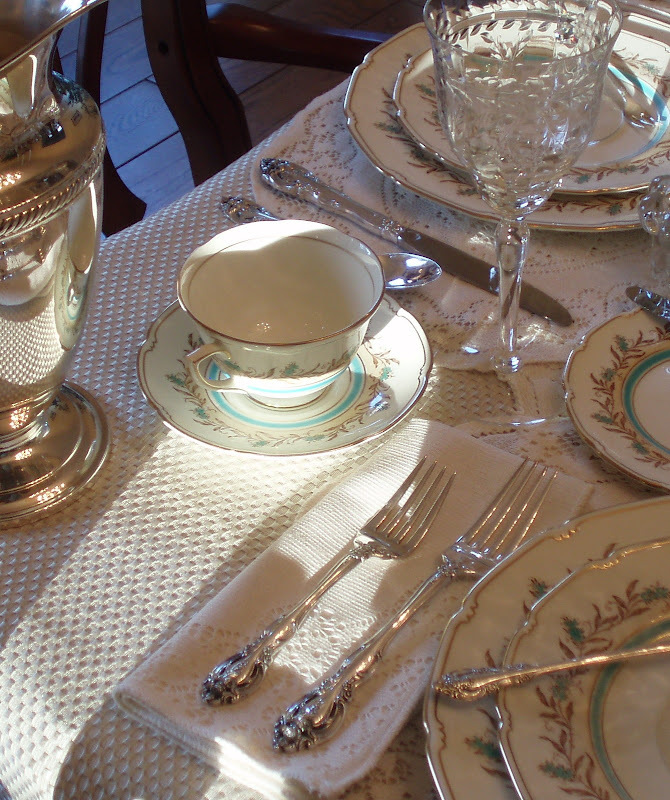 I especially love the Royal Doulton Prelude china and the beautiful Gorham La Scala sterling silver. I actually enjoy polishing silver too. Everything looks so shiny when it is polished. I love Hagerty's Silver foam the best. This is spectacular, as always! :D Beautifully set! Beautiful table as always Bill and a wonderful way to include your blog friends at your table. Thanks for sharing. It is so fun to see this gorgeous table again, Bill & I'm flattered to be included in the seating & see my "name in lights" once more. I wish it could happen in real life! sterling flatware by Gorham, the "La Scala." I have it on my bucket list of things I'd like to acquire before I die. Wishing you cool breezes throughout your home this summer & some extra time in your day so you can create more of these beautiful scenes for all of us. I do remember this post Bill and was so honored to be one of your guests. Our country is abuzz with the new young royals visiting. Me? I would rather be at your table with the rest of the wonderful guests. I haven't visited with you in a very long time. How have you been? Life gets so busy doesn't it. What a joy it always is to view your tablescapes! So happy to see you share this again. Too sweet also for the tiara and robe. I asked Susan if she ever thought of getting "published" if she does I sure hope she will include your tablescapes my friend, you never disappoint! Hi, Bill! What a regal setting indeed! The robe and tiara are the perfect accompaniments to this royal table! This really does look like it could be something set for a festive event at a palace! Have you seen the book "For the Royal Table" by Kathryn Jones? This would fit in nicely. You really have some incredibly nice pieces in your collection, and I'm always so glad to be able to see what you've come up with. Since this was first posted before we "met" on BNOTP, it shows how consistently spot on you are. But I knew that anyway! I love your dinner party as always your Tablescapes are Beautiful!!! I do Remember this post and fell in love with your Sterling Flatware by Gorham,the "La Scala" I hope you have a Great Week with family and friends. The table setting is just gorgeous, loved every bit of it, such beautifully made. The silverware are my fav too. What a wonderful table. I am so sad I did not see my name. I love your sterling, had never seen it before. Especially love the rose on the tip, I have a thing for roses. I think you put a lot of effort and thought into this post. Just beautiful. I am your newest follower. Richard at My Old Historic House. Bill -- this is perfect for celebrating Susan's 150th Tablescaping post. And of course, you've contributed so many posts that have made us all sigh with delight and feel like we've gotten the royal treatment! Hope you're having a great summer. I love this table setting...it's positively beautiful! And love the stories about Hyacinth Bucket...oops, Bouquet. She totally cracks me up. You are so right...don't we wish our tables always had a awe-striking, "staggering" impact on our guests. Well, yours always do that to me, especially when there's candlelight! Thanks for another beautiful setting...you are amazing, my friend! Bill, you are right about the R.D. It looks great in both daylight and candlelight. I thought I was the only one who watched "Keeping Up Appearances." She's a hoot. A truly wonderful tablescape. I'm sure the ladies were quite honored to have their own setting at your beautiful table. Fabulicious!!! Just gorgeous. Every little detail. What a beautiful table. Bill, again a brilliant table! I love your tables Bill and really enjoy the glimses of your house.....any chance we can have a "little tour"?..Oh go on pleeeeeeeze? I promise not to laugh if the beds not made..wink wink! What an absolutely magical post. Beautifully presented images, depicting the most lovely table settings, and such an imaginative approach all combine to make this an absolute joy to look at and read. Thank you so much for this and also for visiting our blog, for leaving such a very generous comment, and for becoming a Follower. We are so delighted because of it to find and be able to follow you. We much look forward to future posts. I haven't watched Keeping up Appearances in some time - just forget about it being on. Stay cool - it is hot out there. So you just happened to have that robe just sitting around the house? I loved seeing this because I feel as if I know most of the people at the table. What a fun discussion it would be. The china is very pretty...love that color of blue. I was having a difficult time with my previous blog (technical issues). So off with the old and on with the new. I started a new blog and find it most appropriate considering I find myself living back in the South. It's truly a privilege to have such a dashing gentleman with a fabulous eye for tablescapes to follow me once again. Hope to see you there! Gentleman Bill, I had just started blogging when you first posted this breathtaking table. I poured over every word and detail as I did again today. I would love to see all your masterpieces in a book.... wouldn't that be a dream? I would be able to look at them over and over and learn the fascinating histories behind each set of china and stemware and flatware. And also look at they way you elegantly and purposefully set each table. Weaving stories and information around each table as only you can do! I am so impressed Bill! This is just outstandingly beautiful! Susan must have felt so honored when she saw it! This table simply glows! I love the china, the silverware, the flowers, well everything! Thanks for visiting me, I am blogging less but I still love it! Bill, I always say "Oh Hyacinth" (Bill) and stagger back a step or two, every time I see one of your glorious tablescapes. I love "Keeping Up Appearances" and your fabulous tablescapes would certainly make Hyacinth green with envy. So breathtakingly lovely! I so love this! Keeping Up Appearances was one of those shows we'd watch with my grandmother and laugh all the way through. My oldest son would refer to it as "Grandma's Ladies". Really the photography is an awesome.Thanks for this type of posting.If you're looking to buy Crowns, Tiaras, Wedding Tiaras, Rhinestone Tiara Crowns, Princess Tiaras, Prom Tiaras, Quinceanera Tiaras, Pageant Crowns, Costume Tiaras, Rhinestone Crown Tiaras, Pearl Tiaras.Here Always in stock and always at low prices. Volume wholesale discounts available on select styles. I am working on one of those posts that seems to be going in many different directions. In my search for photographs of a certain Royal Doulton china pattern I suddenly found myself here at your gorgeous table! My grandmother, whos china I inherited would be honored to have you as a guest at her table! When I saw Coty's place card I remembered reading this when you originally posted. Coty introduced me to you and to Susan. They are both very special arent they...Thank you for such a beautiful post! Glads Make Me Happy Table!